Seventy seven years ago, on Dec 17, 1936, Edgar Bergen brought his companion, Charlie McCarthy, to the radio waves for the first time. The show was The Royal Gelatin Hour hosted and directed by Rudy Vallee. Better known as The Rudy Vallee Show, the program was going through a barely noticeable shakeup of its own. From 1929 Tuesday nights were dedicated to Rudy entertaining radio audiences and pushing Fleischmann’s Yeast. Rudy Vallee was one of the earliest “crooners”; his voice wasn’t really strong enough to fill theaters before electric amplification, but he was able to use the microphone to create an intimate and appealing (to young women) sound. NBC head of programming, Bertha Brainard, pushed for Vallee to host the show, explaining that “only a woman would understand the appeal of Rudy Vallee’s voice.” Both Fleischmann’s and Royal Gelatin were both products of Standard Brands, so there really wasn’t that big of a change for the show. The Dec 17, 1936 show was pretty typical for the variety show. It begins with a number by Vallee’s orchestra, The Connecticut Yankees, followed by Vallee interviewing professional party giver, Elsa Maxwell. Soon we hear the Royal Gelatin can give us wonderful Strawberry flavor in December, some more music, and a small drama, “Three Diamond Bid”, featuring Douglas Montgomery and Shirley Booth. After the NBC Chimes at the program’s midpoint we are treated to a rendition of “Old Man River” by Bass John gurney, who is soon to make his debut with the Metropolitan Opera, which leads into a toe tapping number, “Riding High” featuring the Swing Kids Quartet. In the 38th minute of the program Rudy tries to answer the question that has been bothering us since the intro: Why put a ventriloquist on the radio? Rudy explains that Bergen depends more on his Fred Allen like wit that the “believe it or not” elements of the ventriliqual craft. He also shares that Bergen was very well received at one of Ms. Maxwell’s recent parties. Edgar: There will be a small starting salary. Charlie: But it will start? Charlie: Could you tell me how small? Edgar: No, I can’t say that. Charlie: Oh, they don’t make money that small! Edgar: Well, I’m sure they will pay you what you are worth. Charlie: Well I wouldn’t be interested in that kind of money! The act was a big enough hit that Vallee wanted to book them for rest of the season. Unfortunately Bergen only had three weeks worth of material prepared! The sponsor was just as impressed as the audience. Standard Brands also sponsored The Chase and Sanborn Hour, which began to feature Bergen and McCarthy in the 1937 season. The radio ventriloquist would have an 11 year run with the coffee program. One of the most infamous broadcasts was on Dec 12, 1937, when Mae West performed a version of Adam and Eve written by Arch Oboler. The Sunday School story had such a risqué slant that Miss West was black-listed from radio for many years. In 1949 Bergen would move to CBS for The Charlie McCarthy Show sponsored by CocaCola. 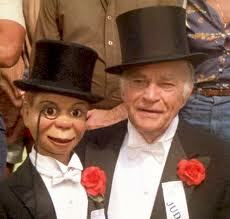 Edgar Bergen is honored with three stars on the Hollywood Walk of Fame at 6425, 6766, and and 6801 Hollywood Blvd. 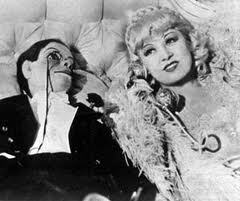 This entry was posted in Charlie McCarthy, Comedy, Debut Episode, Fred Allen, Historic, Mae West, NBC Chimes, Old Time Radio and tagged Charlie McCarthy, Edgar Bergen, Royal Gelatin Hour, Rudy Vallee. Bookmark the permalink.